Hola! The last few days thoughts have been popping up in my head as I'm working my 9-5, "Why do I Blog?" Now I am not a writer by trade, but a few years back I wanted to pursue a career in Public Relations and I knew PR professionals do some writing and I wanted to to brush up on my writing and prepare myself for what was to come(writing)...kind of like being a few steps ahead of myself. Here I am 5 years later from that thought and still not working in the Public Relations field, but I am still blogging. Why? I actually really come to enjoy blogging. Now my blog is not as big as other blogs-yet, but that is ok; my blog is my baby. Looks like I will be blogging for a little while longer. 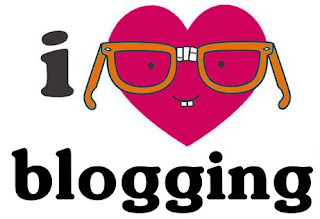 If you are a blogger, why do you blog? If you are not a blogger have you ever considered blogging? good question. I've been asking myself that lately. I just enjoy sharing what I know with the world, but I also like to interact with people from all over the world and all walks of life. But also I hope to someday have my blog really grow and tie it into my career. Great reasons. I recently had to get back to my original point of starting a blog self expression and helping others. Its easy to start trying to make it big and make money from blogging. I remembered that isn't why I started, if I make money along the way great if not thats cool too. I love to write, I always have so that is what I will keep doing, glad you are too! I started blogging because I'd lost my voice. Becoming a stay at home mom is a true blessing but it can also be isolating and stifling. I needed a form of self expression and an outlet that could remind me of the girl I used to be. Lol. I also needed an inexpensive way to market myself as a professional makeup artist. Why do I blog??? I enjoy writing!! Honestly. This is also a form of self expression for me. I don't really get the opportunity to connect with as many people as I would like to throughout the day, so I decided to start generally writing about average things that go on in life and share my thoughts with the world.